Dental implants have changed the way in which dentistry is practiced today. Although implants are not for everyone, once evaluated if you are a candidate, it can provide a highly reliable restoration. General Health and sufficient thickness and length of available bone. If it is determined that you are not a good candidate for an implant, other restorations can be considered, such as a non-metallic fixed bridge or a partial removable denture. 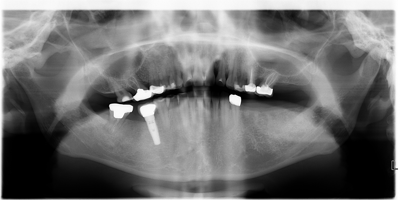 Once it has been determined that you are a good candidate, the next question is what kind of implant to place. 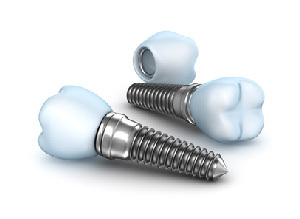 There are basically two materials used in implants today: Titanium and Zirconia. The advantage of titanium is that it has a long, proven track record and there are hundreds of companies with many systems to chose from. The disadvantage is that it is a metal. The advantage of zirconia, is that some people consider it more biiocompatible. The disadvantage is that they are very limited and new. They are very large and invasive and they often need to be reshaped with a bur to fit properly, creating the possibility of micro-fractures. I will be the first in line when zirconia implants become smaller and more patient and doctor friendly. 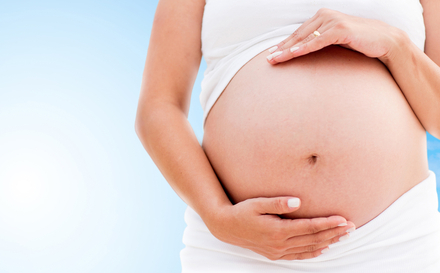 Implants vary tremendously in size and design. It was earlier thought that the larger the implant the better. Latest research show that that is not necessarily the case. 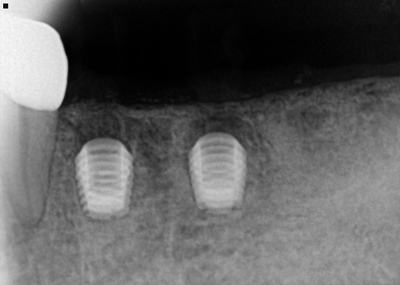 There are also implants that are cemented, others that are screwed in and some that are designed to just click into place (something called a cold weld). In my practice when we feel an implant is the right choice, we have opted for a very small (much less invasive) and well designed titanium implant that is coated with a bio-ceramic material. This implant is placed and allowed to properly integrate, making sure the bone around it “embraces” it (we find that to be the case in over 95% of our cases). 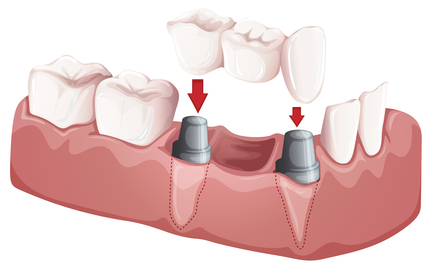 Once the implant is solid, we proceed to place an abutment (connecting the implant to the crown) and a crown. These implants, although a fraction of the size of conventional implants, have a longer life expectancy and because of their small size, allow us to place them most of the time, without the need of additional and costly surgical interventions such as nerve repositioning or sinus lifts. In addition, the post-operative discomfort is significantly reduced when the procedure is not so invasive. To determine which dental implant option is best for you, Call (619) 313-4996 for a free consultation with Dr. Daniel Vinograd. Female: We have very special guests for you today. A lot of times, especially in the natural health community, conventional dentists don’t get a very good rep. And in many instances, it’s for very, very good reason, that they deserve it, exactly. But we have one of the good ones here today who is not only a [inaudible] and a dentist, but also a very lovely man, and one who takes a balanced approach that works in the real world. So please welcome Dr. Daniel Vinograd. Unfortunately, it’s not that way anymore; it can’t be that way anymore because there are a lot of commercial interests that get in the way. There are a lot of lovely, lovely people there. Wonderful healers. I had the opportunity of going to South America, Central America often, and I share some of the best, most lovely times with a lot of very, very wonderful people who are out there, and all they want to do is heal the world. So there are wonderful people out there, but we have to be realistic. There are a lot of commercial interests out there, a lot of financial interests out there, and so we have to fend for ourselves. You guys agree? Right. So why do we need to take responsibility for our health? Especially in dentistry, what the focus of dentistry has been over the years is functionality. So to some degree I would say the dentist became the engineers of the health professions, because – why? Because we are always into detail, into repairing something, into making something functional. Unfortunately, someplace along the way, we forgot that we are actually doing our engineering inside human beings. I’ll be honest with you. When I first started practicing, many years ago, I have to admit, I came out the same way. Dental school, focused on which were the most resistant materials, which ones were the most pliable materials, and I began practicing in a way that was very dissatisfying to me because I was actually just doing micro engineering. Once I realized that there was a human being behind there, the gates of heaven opened up for me as far as my practice and the way I practiced. So I used to have a good friend who used to do a lot of the dental material research at UCLA, and I always asked them, you know, why are you guys always looking about compression forces on dental amalgams? How about the biocompatibility? But there was another group, American Society of Dental Surgeons, and they’re like the first heroes here, and they actually started understanding that how can mercury, which is so toxic, be okay to put in people’s mouths? So they began a countercurrent here, and they began to not allow its members to use the amalgam. If you wanted to belong to this very prestigious organization, you could not use amalgam. Unfortunately, in 1856 it was disbanded, and from then on, amalgam has been the go-to material for dental restorations. Now, mercury is one of the most toxic elements known to humans. And there are people who say, you know, “Dr. Vinograd, Daniel, what if you’re wrong? What if, you know, once you get the amalgam bounded with the metals, with the silver and so forth, what if at that point it really is inactive? It really doesn’t hurt anything?” “Well,” I say, “maybe you’re right. There is a possibility that you’re right. There’s always a possibility that there is another opinion, another way of looking at things. But why would I even take the chance, right? Why would I put something that the US government, Department of Health and Human Services, has categorized as the third most poisonous material that they know of?” Right? I mean, why would I – would I want to put that in my mouth just to find out if somebody’s right or somebody’s wrong? I’m not doing that. And I’m not doing this for my patients, either. As a matter of fact, we spend a lot of time and effort taking care of that and removing that in a safe manner, as some other holistic dentists do. Now, this is not me. This is not a bunch of quacks, right? This is not holistic people. This is the US government that’s saying this is so. I’ll back it up for you. So back thirty years ago, I was already beginning to have some doubts. I had a personal experience where when I first got out of school, you know, thirty some odd years ago, we were handling the amalgam, we really were not even using gloves or mouthpieces, and we were taking the amalgam and squeezing it like this into the trash can, and then using it in people’s mouths, so about five years into my practice, I started feeling really ill, and I felt, you know, into my thirties – this is what being into your thirties feels like, is getting old, right? And I was forgetting things, I just felt awful, and I started really trying to find out what was wrong, and I found out I was incredibly mercury toxic. And so that was my journey, that was my wake-up call, and I began to look at the possibility that this was really a nasty material, and sure enough, you know, I was able to cleanse, I was able to detox a lot, and you know, a lot of things reversed, so… Yeah, this is mostly what I got from my colleagues back there. So why doesn’t your dentist show you what mercury amalgam is such a hazardous substance? All you have to do, all your dentist has to do is go back to the manufacturers. They’ll tell you every possible injury that you could suffer from the use of amalgam. Well, for good reason, right? So, you know, I don’t want you to think that I think dentists are doing this maliciously. I think there’s just a lot of ignorance, a lot of doing things the same way we’ve always done them, and they work, and they’re okay, and not wanting to look, right? And this is what we see, Anastasia and I see in our practice all the time. Every day, this is what we’re seeing. Now, not only are amalgams toxic and they have mercury, but when they’re fresh in the mouth, they are really releasing quite a bit of mercury and mercury gases. When they’re old, they begin to expand. After a decade or two, they begin to expand. The margins actually separate from the tooth, and not only they start leaking again, but you start having underlying decay, and one of the things that we see often in our practice is they start cracking teeth because they’re so hard, it starts expanding, and so we do multiple crowns every month based on patients coming in with fractions caused by amalgams. So these are fairly toxic restorations, and again, this is what we see in our office. Once we remove them, you know, a lot of the times, you know, this is what we find. I don’t know if you can see on that side the fracture line. Can you see the fracture line right between the two spaces there? Yeah. And those are very, very common. You’ll see those fracture lines from amalgams, and that’s usually what we find underneath. And, you know, fortunately, today there’s so many different materials. Are all of the materials to restore teeth healthy? No. And I’m here to tell you the truth: there are really no perfect dental materials, but you have amalgam here, and then you have composites here, and then you have porcelains here as far as, you know, how invasive they are to our systems. And they all have their pros and cons, and this is what I’m here to do today, to have you guys understand what it is that each material contains so that you guys can make good decisions. So there are different amalgam removal protocols, so if you’re going to remove your amalgams, you want to go to somebody that is going to remove them safely. If you had asbestos in your roof, you’re not just going to start yanking it out. It’s not a good thing to do, so same thing with amalgams. And there are a lot of different protocols, and this is where I want you guys to start really thinking, because we go to the internet and we read all the stuff, and, you know, we get patients all the time saying, “Doc, this is what I want. I read this in the internet, and they say ,“ they, whoever they is, “and they say that this is what you need to do.” And some people say, “I only want you to follow the International Academy of Oral Matters and Toxicology protocol, or the [inaudible] protocol, or any of the above variations.” And bottom line is all those protocols are very important – you should have oxygen, you should have a rubber dam, you know, you should really protect your body from reingesting a lot of these amalgams – but really, we shouldn’t take our eyes off of the A ball. And what does that mean? It means that poorly implemented protocol, even if you’re following the best protocol, is not as good as a simpler protocol that is well-implemented. And what is the most important thing is placing a good rubber dam. That is your physical barrier. You see your teeth on this side, and everything else on the other side, so as you are working with the amalgam, you know, you’re not going to be actually reingesting a lot of it. In our office, we tend to use something that we call liquid dam that we actually seal around the teeth to provide an extra level of protection.